Watching practice for the German Grand Prix at Hockenheim this weekend reminded me how much I miss the old layout. That run into the forest was a strangely eerie experience and one that, in the rain especially, was reportedly terrifying. These days we are used to clinical, carefully planned and often characterless tracks that will never reach the iconic status of some of the more celebrated venues, and the current financial problems threatening the Nurburgring – one of the most iconic of all – serves only to remind us of the great circuits we have loved and lost. Germany’s two famous circuits should also be joined by the quite astonishing AVUS facility, which in its original form when it opened in 1921 was basically two six mile straights (yes, you read that right) joined by a corner at each end. When the north curve was steeply banked in later years AVUS laid claim to being the fastest circuit in the world. It was used for one World Championship Grand Prix – in 1959 – a race that was, unusually, run as two heats. In fact, this is unique in the history of the World Championship. The overall winner was Tony Brooks, in a Ferrari Dino 246, and the average speed was an amazing 143mph. It was, of course, ludicrously dangerous, as evidenced by the death of the great Jean Behra that very weekend when his Porsche crashed in a support race. It is interesting to note that the circuit’s two straights now serve as a vital part of the German road network in the region. Britain has its fair share of abandoned and long-forgotten racing circuits, but few of those can claim to have held a Formula One race. The legendary Brooklands, now partly obliterated, is from an age before our time, but there is one circuit that held five British Grands Prix that is no longer with us. This was Aintree, a circuit built in 1954 within the confines of the famous Grand National horse racing course of the same name, and it held the race in 1955, 1957 and 1959, as well as in 1961 and 1963. A compact yet challenging circuit – billed ‘the Goodwood of the North’ – it was last used in full in 1964, and nowadays the parts that remain still host sprint races and time trials. We must not forget Brands Hatch, once a regular British Grand Prix host and now a much-overlooked venue, or Donington, disgracefully used as a pawn in a failed attempt to take the race to a circuit other than Silverstone. Both are much loved venues, and continue to host racing to this day. Many in the sport still mourn the loss of Imola, home of the San Marino Grand Prix for many years and sadly immortalised as the scene of Ayrton Senna’s death in 1994. Yet Imola is not the only Italian circuit to have hosted F1 races and fallen by the wayside: Pescara – home for many years of the famous Coppa Acerbo sports car race – was part of the World Championship in 1957, an oddity prompted by the cancellation of the races in Belgium and Holland. Many will tell you that the famous Nordschleife, the main part of the Nurburgring, is the longest of all World Championship circuits. In fact, that honour goes comfortably to Pescara, at 15.894 miles. Although F1 races had been run on the perilous road course in the past the 1957 event would be the only one to count towards the title. The race was won by a young Stirling Moss in a Vanwall, who covered the 18 laps in little less than three hours. 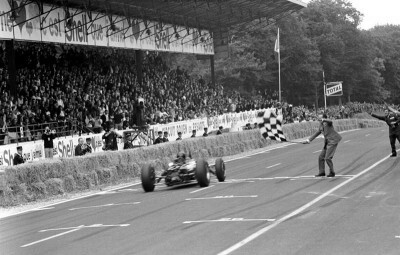 Perhaps the country that can lay claim to the most ‘lost’ Grand Prix circuits is France. Currently absent from the calendar, the French can also claim to have ‘invented’ Grand Prix racing. Looking back over the years to the beginning of the current World Championship in 1950 one comes across many evocative and long lost circuits languishing in the French countryside. We begin in 1950 with the original Reims-Guex circuit, a tortuously fast triangle of public roads first used for racing in 1932. Juan Manuel Fangio won the 1950 event, and shared victory with Luigi Fagioli the following year. In 1952 the French Grand Prix moved to another public road circuit, the magnificent Rouen-les-Essarts, then a state of the art facility with modern pit buildings and more. It is amazing to remember that the hairpin was actually on cobbled roads! The circuit held the race six times between 1952 and 1968, with victors including Alberto Ascari, Dan Gurney – twice – and Jacky Ickx. 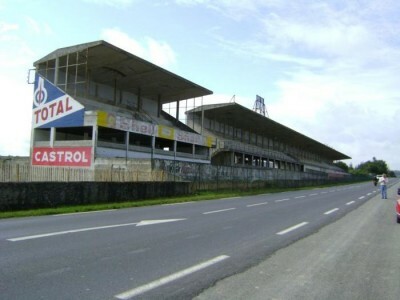 Reims, meanwhile, had been remodelled into a faster and more challenging circuit, and would generally alternate year by year with the Rouen circuit, until – in 1965 – the now largely forgotten Charade circuit made one of only four appearances as French Grand Prix host. It is impossible to imagine a circuit such as this being used today. You may know it otherwise as Clermont-Ferrand, and it is an extraordinary place. Five miles long and a mass of tight corners and amazing inclines, Charade was a throwback to an earlier era, and the massively truncated and sanitised circuit that still operates there now is a different place entirely. A sort of mini-Nurburgring, it saw victories from such as Jim Clark, Jochen Rindt and Jackie Stewart – three of the greatest of the era. Apart from a curious interlude when the Le Mans Bugatti circuit hosted the French Grand Prix in 1967 – with Jack Brabham taking the flag – from 1973 until 1990 the race would alternate between the fresh new Paul Ricard venue – still in existence as a high-tech test track today – and the glorious rolling hills of Dijon Prenois, until the new, much maligned Magny Cours facility took over in 1991. Stirring memories of glorious races in wonderful locations are there to be kept. Sadly, many of the fabulous racing circuits of yore remain only in films and on photographs. History doing what it does naturally. If you have enjoyed this trip down memory lane, look out for a future entry where we will look at the lost circuits on the other side of the Atlantic.